Left hand on thigh, right hand relaxed: bend down to the right. Other side. Left hand on left knee, right hand extended up: rotate to the right. Change sides. Left hand on thigh, right hand extended to right: reach to the right as far as possible. Change sides. Arms extended forward: reach forward as far as possible. 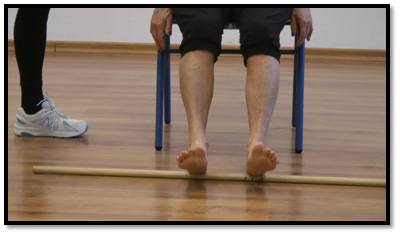 Roll stick from heels to toes. Lift knee up. Hold for a few seconds. Other knee. Lift knee up, open to side, put down on floor. Lift again and place foot back. Other side. Lift knee up and opposite hand forward. Change sides. Lift both knee and opposite hand up. Other side. Get up with hands lifted forward.